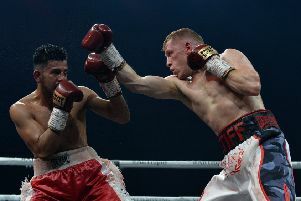 Stephen Tiffney came up short in his bid to become WBO European featherweight champion after being stopped in the seventh round by Ireland’s David Oliver Joyce. The Edinburgh man turned in a brave display at the Emirates Golf Club in Dubai before the contest was brought to a halt just a second short of the bell. Tiffney had travelled with his team confident of returning home with the belt but was beaten by the better boxer on the night. It was the 30-year-old’s second loss in his 12 professional bouts following defeat to compatriot Lewis Paulin 16 months ago. Tiffney edged a competitive first round and looked to have found his range. However, the undefeated 32-year-old from Mullingar, looked more dangerous as the rounds wore on. Despite a strong opening to the seventh round by the former Lochend amateur, Joyce sent Tiffney to the canvas with a huge right hand. The Scot got to his feet but Joyce pounced forcing the referee to intervene. “I’ve got so much respect for Stephen Tiffney and he gave it a good go,” Joyce said afterwards.